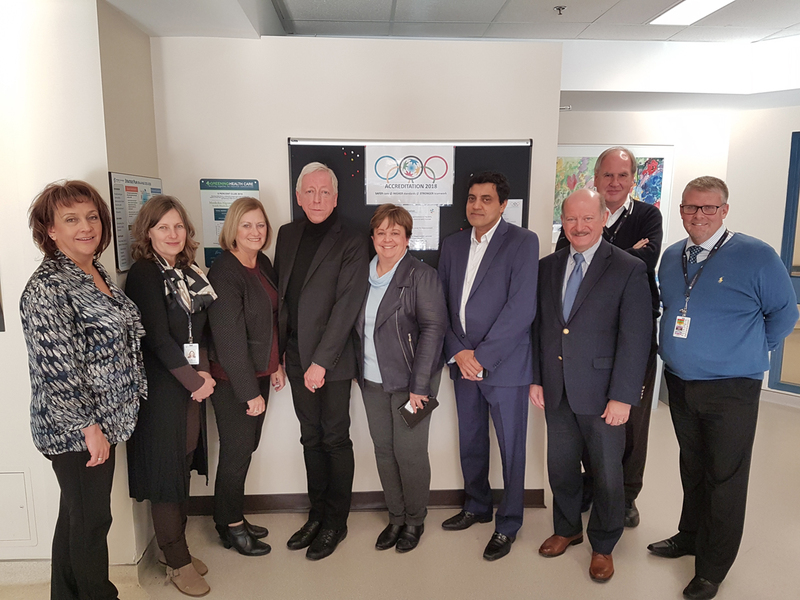 Survey team members pictured above, from left: Donnalene Tuer-Hodes, Huron Perth Healthcare Alliance; Richard Wray (intern), Sick Kids’ Hospital; Susan Kwolek, Mackenzie Health; Dr. Naveed Mohammad, William Osler Health Systems; Ron Noble, Catholic Health Association of Ontario. Staff at Muskoka Algonquin Healthcare (MAHC) are feeling pretty good these days. The healthcare organization was awarded the highest possible rating from Accreditation Canada – Accredited with Exemplary Standing under the Qmentum accreditation program. The decision follows MAHC’s onsite survey across both sites by an external survey team in December 2018 as part of an ongoing accreditation process to ensure high-quality care and safety in every facet of hospital operations. The accreditation process is voluntary and conducted by third-party Accreditation Canada, a not-for-profit organization, which evaluates health and social organizations against best-in-class standards established by their affiliate, Health Standards Organization (HSO). Following the four-day survey with five Accreditation Canada surveyors, it was determined that MAHC met 100% of all required organization practices and 98.4 per cent of the high priority and other criteria. In total, more than 2,400 standards were assessed, examining all aspects of health care and organizational practices from patient safety and ethics, to staff training and partnering with the community, governance, and communication. The process is about constantly improving the quality of care provided to patients by ensuring the organization is meeting national standards of care, according to Natalie Bubela, Chief Executive Officer for MAHC. The Board of Directors is equally thrilled with the accreditation decision of exemplary standing. The focus of accreditation is on the processes used to deliver care, not on individual health care providers. The whole organization is involved in the accreditation survey, from front-line staff and volunteers to board members, patients, and families. In the decision report, the survey team highlighted the great collaboration between MAHC’s two sites, the congenial and supportive teamwork of staff and physicians, as well as the strong governance and leadership of the organization. Building on this award, MAHC will continue efforts to improve the quality and safety of services and processes. MAHC’s next accreditation will take place in 2022. Accreditation takes place every four years. Parry Sound Muskoka MPP Norm Miller issued a release in January, congratulating both MAHC and West Parry Sound Health Centre. Congratulations!! I know what hard work this is. You should be proud of yourselves for this achievement and your communities should be proud of you. We are lucky.